Provide comfort for the family of Virginia Esguerra with a meaningful gesture of sympathy. 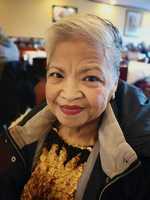 It is with great sorrow that we announce that Virginia Capistrano Esguerra passed away peacefully in her sleep on Monday, April 8, 2019. Virginia's passing is just 19 weeks after her husband, Florante's passing. Virginia is survived by her children: son, Elroy (Milcah), daughters Jocelyn (Joey), Anna (Rufino), and Peggy (Ed); her siblings, Susan, Jessie, Joseph and Boy; and her grandchildren Ainsley, Brayden, McKenna, Londyn, Jalen, Izabella, and Aiden. Virginia was born in Taguig, Rizal, Philippines on March 16,1948 and came to Canada in 1969 as a seamstress. In 1972 she sponsored her husband to come to Canada and soon married on March 30, 1974. Virginia first started working at Gemini Fashions, with brief stints working at many companies and finally retiring from Gourmet Bakers in 2013. Viewing/Lamay will commence at 6:00 PM and Vigil Prayers will be said at 7:00 PM on Saturday, April 13, 2019 at Mosaic Funeral Chapel, 1839 Inkster Blvd. Winnipeg, MB. A mass will be held on Monday, April, 15, 2019 at 11 am in St. Peter's Church at 737 Keeeatin St. Winnipeg, MB. To send flowers in memory of Virginia Capistrano Esguerra, please visit our Heartfelt Sympathies Store.